Asphalt shingles were first introduced during the early 1900’s. They quickly grew popular, standing out as the most widely used roofing materials available. Shingles are designed for steep-sloped roofs, where they act as a water-shedding component. They are most often used on residences, and they are primarily made out of asphalt components that consist of a reinforcing mat, either an organic felt or glass-fiber mat, and surfacing which helps give the shingle strength. Organic shingles were the first to be available to arrive when production began. The term “organic” simply refers to the conventional felt mat asphalt shingles. Although companies stopped manufacturing organic shingles around 2005, they can still be found today. The decrease in popularity and production was brought on by their failure to last longer than fiberglass shingles. 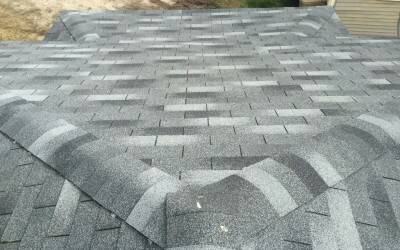 Another type of shingle available is the fiberglass shingle. Originally, the mat of the shingles was produced using a wood and paper felt material. Now, more advanced mats are created from fiberglass, providing greater dependability, strength, and quality.